Is a secret area inside of the Great Pyramid going to be finally revealed after thousands of years of being sealed off? Does a small shaft leading upwards from the Queen's Chamber contain any big treasures? One thing is certain and that is there are no shortages of legends telling of secret rooms and shafts inside of the Great Pyramid but after years of careful research, most Egyptologists are fairly certain that there are no large areas inside of the pyramid that are still hidden. This is not the case with a shaft leading upwards from the Queen's Chamber though. The shaft is very small in size and is completely blocked by two small doors with copper handles attached to them. Egyptologists have multiple reasons of what this shaft could have been used for. Among them are ventilation shafts, some kind of astronomical function, or a path for the King's soul to ascend to the stars and therefore the afterlife. Of course, the real reason could very well not even be among these three possibilities and might never be fully understood. In 2002, a team led by Zahi Hawass and the Egyptian Antiquities Department along with the National Geographic Channel started a research experiment to explore what lay hidden behind the stone doors inside of the shaft. A robot nicknamed the "pyramid rover" was constructed to make its way up the shaft until it reached the stone door obstructing the rest of the tunnel. 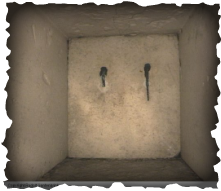 At that point, the robot would drill out a small opening on the stone door and place a small camera inside of the hole to see what lay hidden on the other side. 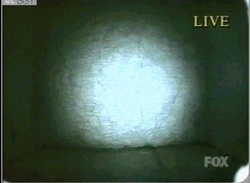 On September 17, 2002, on live television throughout the world, the drilling was completed and the camera was inserted to reveal ........... another stone door. This second door was a complete mystery to all the researchers and Egyptologists and continues to remain a puzzle. There is huge excitement over what may lie hidden behind this second door as one researcher said "It (the 2nd door) is not similar to the first in that it looks as if it is screening or covering something. There were also cracks all over the surface." So, what lies hidden behind this second door? Almost every researcher involved with the project is certain that the shaft is not hiding anything of any considerable size due to the dimensions of the shaft itself. Now, this does not mean that there is nothing hidden behind the door either. But whether there will be found something or nothing, all of the researchers involved agree that it will answer questions either way. So, when can we expect the drilling of the second door to start? Most of the team members are aiming for the mid 2011 time period to fully complete the testing and then the actual exploration of the shaft. So, it looks like we only have a few more months wait before a space that has been sealed for thousands of years is finally revealed again.